I often hear that my hair is nice, thick and dense. Yes, it looks great when it’s loose and freshly washed – silky smooth and shiny in the sunlight. Still, those who have a different hair type don’t know how difficult it is to care for heavy and easily weighed-down hair. I can’t do much about styling because this hair type is totally unrewarding and curl-resistant; curls last 3 hours tops, then my hair looks like a disaster. To make things worse my scalp goes wild because there’s bad circulation due to thick strands. Using a joke – the ventilation doesn’t run smoothly. That is why the scalp doesn’t get enough oxygen so hair roots get greasy in no time (the sebum balance is disturbed). There is one more demon of heavy and thick hair; choosing the right products is a challenge. Hair masks, styling primers, conditioners don’t want to cooperate, leaving my strands weighed-down, flat and heavy. Although there are special shampoos for oily hair, I’ve spotted such shampoos have nothing to do with the scalp care. They cause dryness so the scalp tries to replenish the sebum by producing more and more… the sebum secretion is intensified. In other words, you must be careful with this hair type: it looks pretty but has its demons. If you have the same type, you know what I mean. 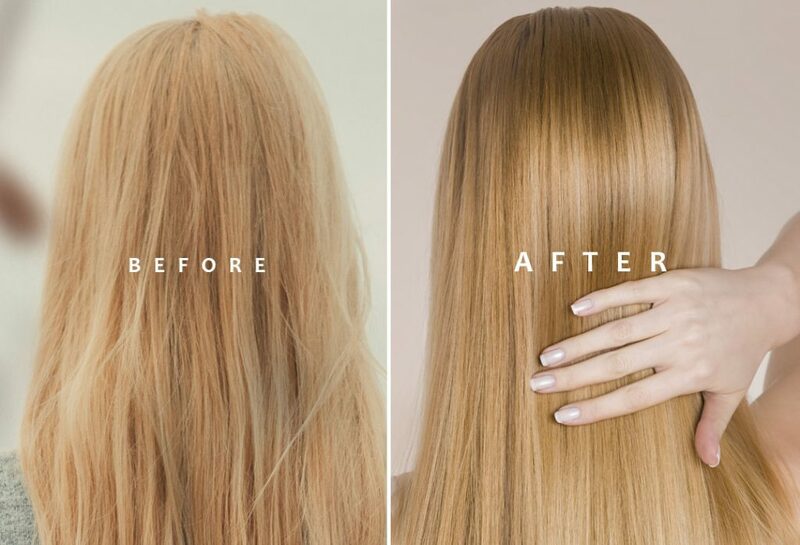 I’m sure you’ll be interested in an extraordinary product – Nanoil for heavy, thick, easily weighed-down hair. I came across the product while searching for a suitable one for my hair; have I mentioned that thick hair is also prone to thinning? Especially, when the seasons of the year are changing. A nightmare. 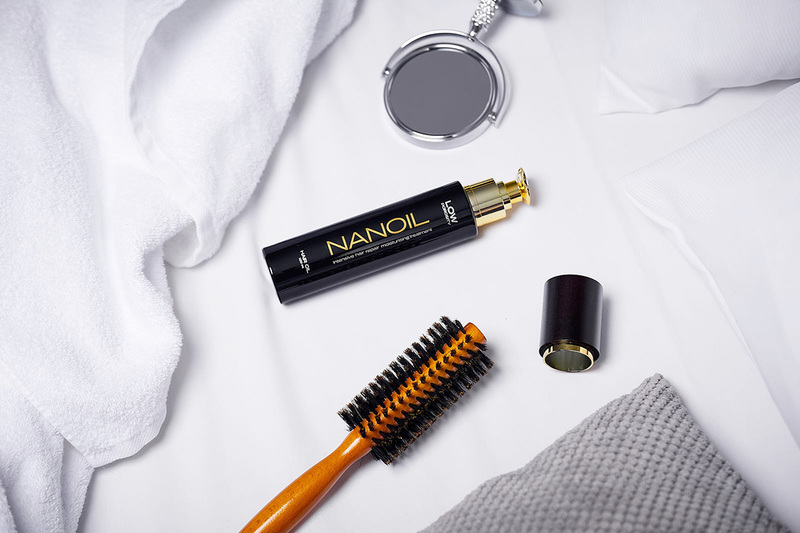 Nanoil is specially designed for heavy, thick, weighed-down and greasy hair. The product hinders hair loss, promotes hair growth, lifts the roots, adds volume and balances the sebum secretion on the scalp… well, well, well 🙂 The description is great. I was curious about the reality. Bought it, used it, the half of the bottle is gone. Today, I know everything about it 😉 Are your curious about Nanoil effects? – Nanoil for low porosity hair – thick, heavy, easily weighed-down, greasy strands. – Nanoil for medium porosity hair – I would call it normal which is often frizzy, static, sometimes falls out in excess, tends to lose moisture, hair ends often need an intensified care, you easily face up to overproteined hair leading to dull strands. – Nanoil for high porosity hair – dry, brittle, damaged, over-processed hair that requires a special care, protection and full repair. I guess none of you is going to have problems with choosing the proper oil. A hair porosity test https://nanoil.co.uk/hair-porosity-test on Nanoil website is a huge plus. You won’t have any doubts about the choice of the right version and hair care that is necessary for your hair type. The ingredients are truly impressive – oils, vitamins, sunscreen and an extra 😉 Let’s move on to the most important part – how to use Nanoil hair oil, how to do a hair oil treatment, what are the Nanoil benefits and reviews. I apply Nanoil to damp hair after washing because hair scales are raised so more nutrients are absorbed more quickly and easily. I leave Nanoil on hair and scalp. The oil is free of parabens and silicones so it’s scalp-friendly – after all, it’s designed to nourish and strengthen mostly the hair bulbs. I put a turban on and wait for an hour (when I have no time, it’s 30 minutes). Before washing it off, I apply a hair mask for five minutes – it emulsifies the oil so I have no problems washing it off. I rinse the oil and mask out, wash hair again, and … voila! I blow-dry or air-dry. I don’t know how much you’re able to pay for a GOOD hair product. I think Nanoil’s price is fair. No other product has ever enhanced my hair as much as Nanoil. It isn’t just a simple oil. It enhances the bulbs, strengthens and stimulates them, improves the condition of the scalp and increases the blood flow, working from within and on the outside for the maximum beautifying 🙂 Stunner! It is long-lasting at the same time; I used up a half of the bottle within three months. That is why, to me, the price is fine. Such a product is worth much more. It is priceless 🙂 I think you can gift yourself with such a treat once in a few months. … my boyfriend is stealing my Nanoil! The last thing, it has surprised me: my boyfriend uses my Nanoil for his beard care 🙂 I have one hot woodsman at home now 🙂 His beard looks really cool – softer and manageable (his words) and not as dry and stiff as it used to be (my words lol). I have already used a number of oils but no other smelled as good as this one. The scent is beautiful and very gentle. Before, I had one of the Indian oils that were to boost har growth but I couldn’t stands the smell of it. I tried applying castor oil a few times and I was completely disappointed. The hair still reasy even after a few washes. My hair doesn’t like leave-in cosmetics at all, my hair is flat even without it. I have a similar situation, every leave-in conditioner overburdens the hair. I have this oil for a while now and I liked it at first..use. After shampooing you don’t have the feellig that the hair is heavy, on the contrary the hair is soft and lightweight. I have low porosity hair. It’s a disaster! I am bound to straight hair for life. For me the one for medium porosity should be perfect. I have nanoil for a month now and so far I can see that after the application, my hair is weightless and softer:) in general, it looks great and does not need washing so often.